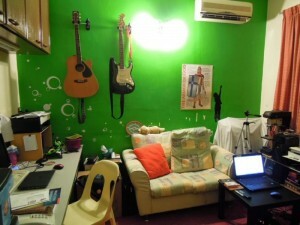 Bernard Hiew sure knows how to get the most of his Penang, Malaysia-based “humble” electrical engineering workspace. 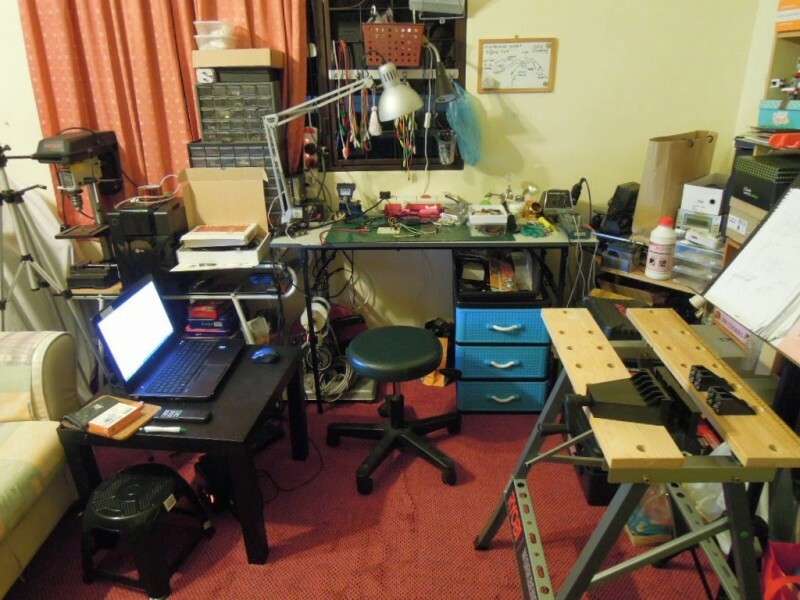 He turned the third room of his apartment into a complete innovation space that’s used for everything from engineering to 3-D printing to playing music to woodworking. I spend my most of my time here, my little humble workspace. 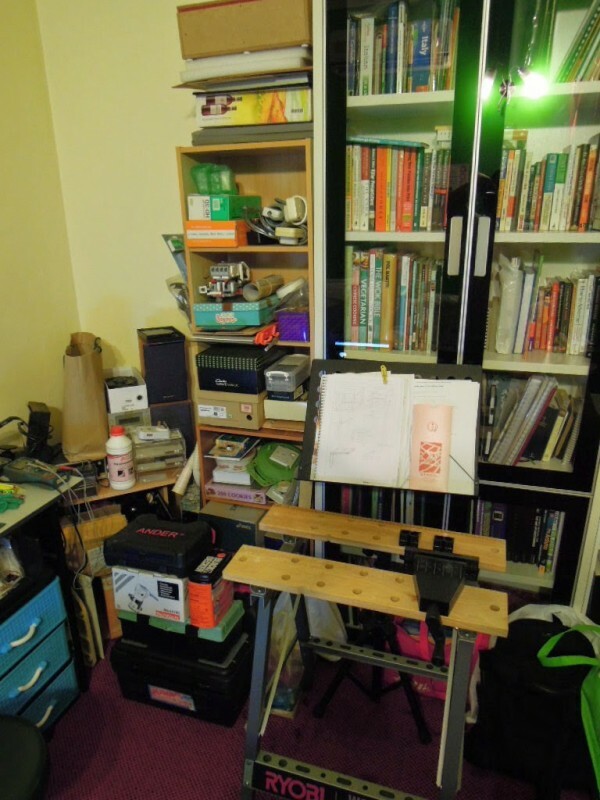 This room is not a dedicated workshop at somewhere else but is in my house. Half of the room is my workspace … The other half of the room is the main table where we do most of office work and surfing. Recently my wife is working from home, so she is occupying this table most of the time. Hiew proves that with a little planning and ingenuity, you can create a fully functional workspace complete with essential engineering equipment and tools. 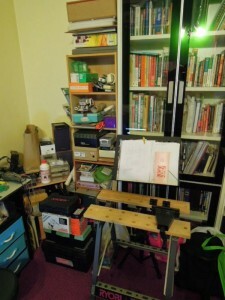 His space includes a soldering station, a PCB UV box, multimeter, power station, computer, book shelves, and even a couch for relaxing and playing music. He also makes great use of storage containers for his electrical components. 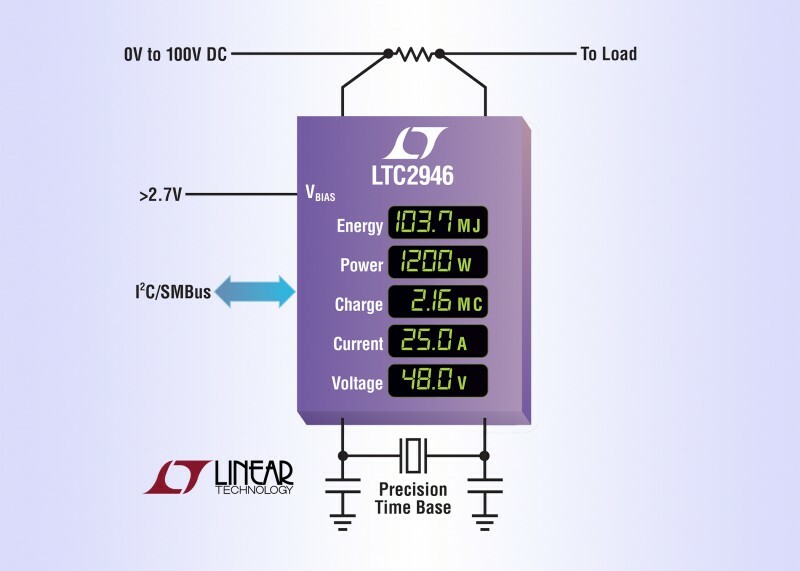 An integrated ±0.4% accurate, 12-bit ADC and external precision time base (crystal or clock) enables measurement accuracy better than ±0.6% for current and charge, and ±1% for power and energy. A ±5% accurate internal time base substitutes in the absence of an external one. All digital readings, including minimums and maximums of voltage, current and power, are stored in registers accessible by an I²C/SMBus interface. An alert output signals when measurements exceed configurable warning thresholds, relieving the host of burdensome polling for data. 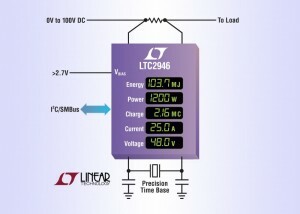 The LTC2946 provides access to all the necessary parameters to accurately assess and manage board level energy consumption. In addition its wide operating range makes it ideal for monitoring board energy consumption in blade servers, telecom, solar and industrial equipment, and advanced mezzanine cards (AMC). 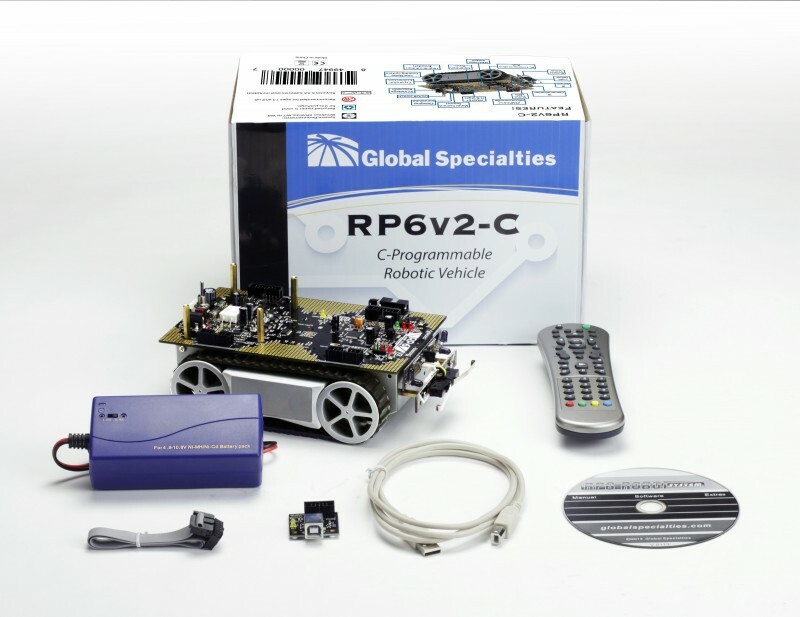 Global Specialties recently introduced a new RP6V2 Robot Kit with RC5 remote and battery charger. The C-programmable autonomous mobile robot system is accessible enough for students and electronics enthusiasts to use. It comes with several example programs and a large C function library. 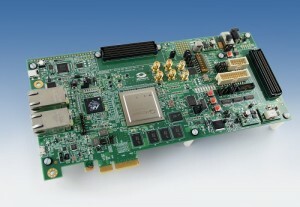 Microsemi Corp. has announced a new larges-density, low-power SmartFusion2 150K LE SoC FPGA Advanced Development Kit. It’s meant for board-level designers and system architects who need to rapidly create system-level designs. When I first started designing, I did not understand the need for the scope posts for hardware test points. I could always tack on a wire or, with many through-hole parts, connect my scope right to the chip. But now test points are essential. My eyesight and steady hands are long gone. But it goes way beyond that. Many of the scope points are buried under the chips. And those that are exposed are smaller than grains of sand. Provide yourself access to the critical points. Bill Porter is a Panama City Beach, FL-based electronics engineer working for the US Navy. When he isn’t working on unmanned systems for the Navy, he spends his time running an engineering-focused educational outreach program and working on his own projects. In this interview, Bill talks about his first designs, technical interests, and current projects. CIRCUIT CELLAR: You’re an electronics engineer for the United States Navy. Can you describe any of the projects you’re involved with? BILL: I work with unmanned systems, or robots that are teleoperated and/or autonomous. This includes systems that swim under water, on the surface, or across the land. The Navy is working hard to develop robots to do the jobs that are dirty, dangerous, or dull and help keep the sailor out of harm’s way. One such system is called MUSCL, or Modular Systems Craft Littoral. MUSCL is a small, man-portable surface vehicle that is used by Riverine Patrol for remote surveillance and reconnaissance. I was the lead electrical engineer for the project. Besides robots, I am also working on a few education outreach programs that work towards getting more students interested in STEM careers. CIRCUIT CELLAR: Tell us about The Science Brothers nonprofit outreach program. How did the program start? BILL: The Science Brothers is my main educational outreach program run out of my Navy base. For two Fridays every month, a few of my coworkers and I will visit a local elementary school to put on a show. 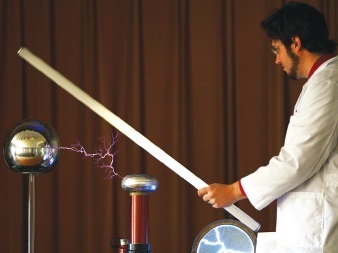 The script of the show centers on the dynamics of two brothers, who specialize in different fields and argue over whose science is “cooler.” The result is a fun and wacky trip exploring different premises in science, such as light, sound, and energy, with examples and demonstrations from the realms of chemistry, physics, and electricity. The program restarted when a few coworkers and I sat down and decided to bring back an old program that had existed on the base in the ‘90s called “Dr. Science.” The goal of the program was to bring science-based experiments to the schools using equipment they otherwise were not able to afford. By wowing the students with the spectacular-looking demos, we get them excited about science and yearning to learn more. 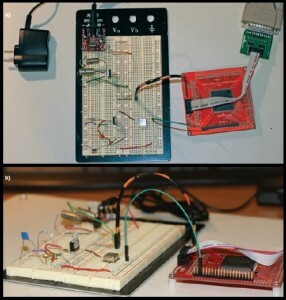 CIRCUIT CELLAR: Your website (BillPorter.info) includes projects involving 3-D printing, motor controllers, and LEDs. What types of projects do you prefer working on and why? BILL: I am a hardware guy. I love to fire up my favorite PCB CAD software just to get an idea out of my head and on the screen. I do not breadboard very often, as I would rather take my chances trying some new idea on a board first. Either it works, or I have an excuse to design another PCB. Thankfully, group-order PCB services have enabled my addiction tinkering at a very low cost. I wish I was stronger at mechanical CAD design to really get the full potential out of my 3-D printer, but I have done well enough without it. It really does come in handy at times, whether it is a quick project enclosure, a mount, or a part for our garden. CIRCUIT CELLAR: Do you have a favorite project? BILL: Yes! My wedding of course! I married the girl of my dreams who is just as much as a geek as I am, and as a result, we had an extremely geeky wedding over a year in the making involving many projects throughout. So much so that our theme was “Circuit and Swirls” and we carried the motif throughout. 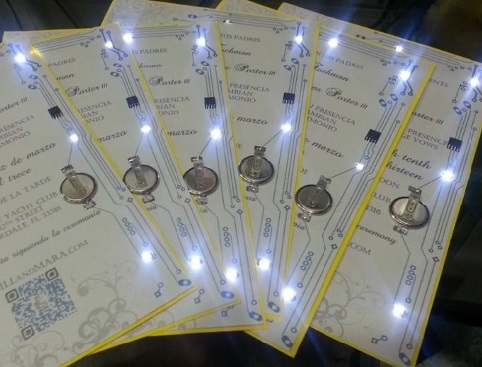 We designed and made our own wedding invitations involving LEDs, a microprocessor, and a clever Easter egg. 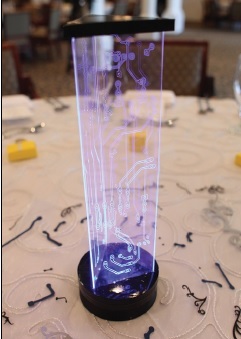 Furthermore, we 3-D-printed our centerpieces, built up our own “e-textile” wedding attire with LEDs and EL wire, and we even had a “soldering ceremony” during the event. It made our parents nervous, but in the end, everyone had a good time. Did I mention I asked her to marry me on a PCB she designed for a project? CIRCUIT CELLAR: Are you currently working on or planning any projects? Can you tell us about them? BILL: I have one main project that is taking up all my time at work and at home. A coworker and I are the technical directors for the first-ever Maritime RobotX Challenge. The challenge, sponsored by Association for Unmanned Vehicle Systems International (AUVSI) Foundation and by the Office for Naval Research (ONR), will take place this October in Singapore. It will include 15 teams of college students from five participating nations and put them to the test by challenging them to design a robot that will complete five tasks autonomously. As one of the technical directors, I have been helping design and build the interactive course elements that the teams’ robots will be facing. Find out more at Robotx.org. CIRCUIT CELLAR: What new technologies excite you and why? BILL: I have always been infatuated by LEDs and ways to conserve energy, so I am most excited to see how efficient LEDs are starting to take over as the new source of light in the household. The complete interview appears in Circuit Cellar 291 (October 2014). Most modern digital and analog electronic devices require a time base to perform their intended function. Found in everything from cell phones to smart munitions, quartz crystal oscillators are widely used in many embedded applications. Quartz resonators’ high Q, excellent temperature performance, and superior long-term aging makes them the clear resonator of choice for many applications. The frequency versus temperature performance of a discrete LC oscillator will be on the order of several hundred parts per million (ppm) per °C, where a crystal oscillator (XO) will have roughly ±30 ppm over the entire industrial temperature range (–40 to +85°C). While being superior to a discrete oscillator, this temperature stability is not nearly sufficient for many modern applications. The temperature-compensated crystal oscillator (TCXO) employs the use of an open loop compensation circuit to create a correction voltage to reduce the inherent frequency versus temperature characteristic of the crystal. The crystals used in TCXOs have frequency versus temperature characteristics that approximate a third-order polynomial, as seen in the nearby figure. The early designs for TCXOs employed a network of thermistors and resistors to create a correction voltage. 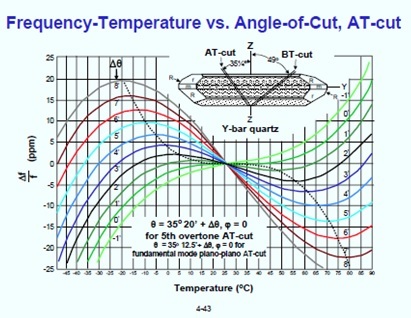 By using thermistors with different slopes and properly selecting the fixed value resistors, the correction voltage can be made to have a shape factor matched to the crystal’s frequency versus temperature performance. The correction voltage is applied to a varactor in the feedback path of the TCXO. This change in capacitance in the feedback path alters the tuning of the oscillator, thus changing the output frequency and compensating it for temperature effects. Thermistor/Resistor network TCXOs can achieve frequency versus temperature stabilities of around ±1 ppm over the industrial temperature range; however, they are limited in their curve-fitting capabilities because of the nature of using discrete thermistors and resistors. Thermistor/resistor network TCXOs are still found in specialized environments including satellite and other space applications where modern solid-state devices do not have the radiation hardness to survive. Most TCXOs manufactured today utilize an ASIC which contains the oscillator circuit and a third- or fifth-order polynomial voltage generator. The polynomial generator is an analog output voltage but also has digital registers for setting the coefficients of the polynomial. The newest generations of TCXO ASICs can provide temperature performances of ±0.1 ppm over the industrial temperature range. This is a 10-fold improvement over what is obtainable with a traditional thermistor/resistor network TCXOs and also has the advantage of a much smaller footprint (5 mm × 3.2 mm). Some high-precision applications require frequency versus temperature stabilities better than ±0.1 ppm. To meet these challenging specifications a different methodology is implemented. An oven-controlled crystal oscillator (OCXO) uses a heater circuit and thermal insulation to keep the crystal at an elevated temperature (≈15°C above the upper operating temperature limit). By controlling the crystal’s temperature and keeping it nearly constant, the frequency deviation due to ambient temperature changes is vastly reduced. OCXOs can achieve frequency versus temperature stabilities of ±0.005 ppm. This improved performance comes at the cost of a larger footprint and increased power consumption. The TCXO’s performance limit of ±0.1 ppm is due to several factors. First, the resonators are not perfect. Their frequency versus temperature stability approximates a third-order polynomial; however, higher order effects are present. Secondly, the polynomial generator is nonideal and induces some higher order artifacts, leaving the user with residuals of ±0.1 ppm. A new methodology which uses an artificial neural network (ANN) to create the correction voltage has recently been demonstrated. The ANN is superior in that the neural network is not inherently shape limited like a third-order polynomial. 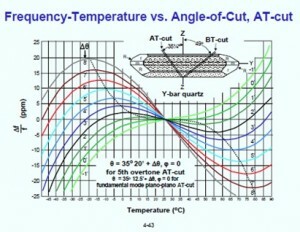 If enough data is presented to the ANN, it can “learn” the crystal’s temperature performance shape and correct for it. This new methodology has been shown to provide ±0.01 ppm frequency versus temperature stability over the industrial range. The ANN algorithm can achieve OCXO temperature performance in a much smaller footprint, and without the need for the power-hungry oven. The evolution of quartz crystal time bases over the last 70 years has seen the frequency versus temperature stability improve by a factor of several thousand. As our need for more stable oscillators in smaller packages with less power consumption grows, the development of better compensation schemes is paramount. The ANN demonstrates a technology that has much potential. Its ability to adapt and change its shape factor makes it ideal for complex compensation problems. John Esterline is the CEO of Esterline Research and Design, LLC, a Pennsylvania based start-up company. John holds an MEngEE and a BSEE from Pennsylvania State University. His research interests focus on temperature compensation algorithms for the improvement of embedded time bases. John is the inventor on two US patents (US8188800 B2, US8525607 B2), and the inventor of one patent pending (US 13/570,563). Esterline Research and Design, LLC offers consulting services in frequency control, test and automation and other subject matter in addition to its RF testing products. Circuit Cellar 291 (October 2014) is now available. 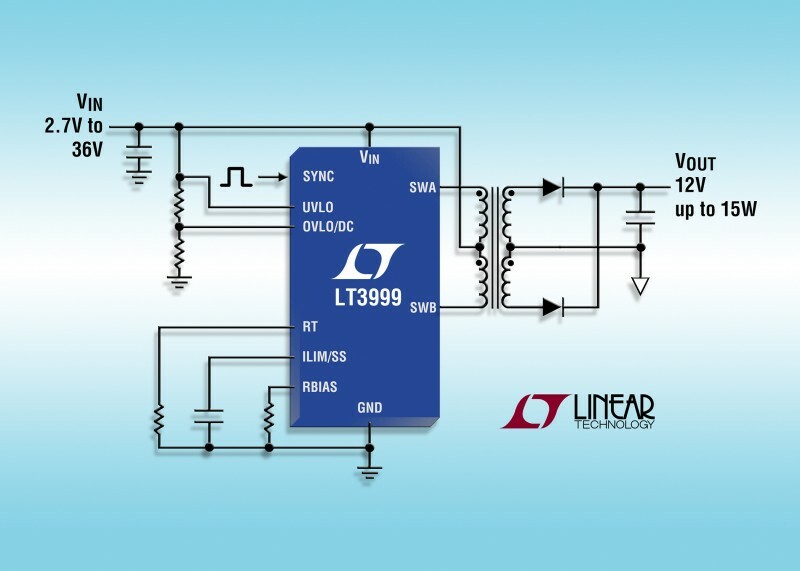 Linear Technology recently launched the LT3999 monolithic push-pull isolated DC/DC transformer driver with two 1-A current limited power switches. It operates over an input voltage of 2.7 to 36 V and is targeted for power levels up to 15 W, making it a good option for a variety of industrial applications. The LT3999’s 1,000-piece price starts at $2.75 each for the E-grade. Microchip Technology recently expanded it’s PIC12/16LF155X 8-bit microcontroller family with the PIC16LF1554 and PIC16LF1559 (PIC16LF1554/9), which are targeted toward a variety of sensor applications. 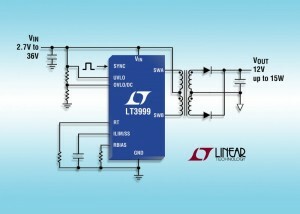 The PIC16LF1554/9 features two independent 10-bit, 100,000 samples per second ADCs with hardware Capacitive Voltage Divider (CVD) support for capacitive touch sensing. The PIC16LF1554 MCUs are available now for sampling and production in 14-pin PDIP, TSSOP, SOIC, and 16-pin QFN (4 x 4 x .9 mm) packages. The PIC16LF1559 MCUs are available for sampling and production in 20-pin PDIP, SSOP, and QFN (4 x 4 x .9 mm) packages. Pricing starts at $0.63 each, in 10,000-unit quantities. 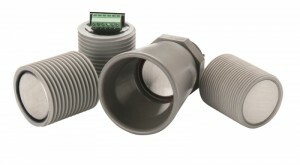 MaxBotix’s new 4-20HR-MaxSonar-WR sensors are high-accuracy ultrasonic sensors featuring a 4- to 20-mA output. Each sensor is an affordable IP67-rated drop-in replacement for use with existing PLC/process control systems. The sensors reject outside noise sources and feature speed-of-sound temperature compensation. The 4-20HR-MaxSonar-WR sensors provide range information from 50 to 500 cm and have a 1.6-mm resolution, an operational temperature range from –40° to 65°C (–40° to 149°F), real-time automatic calibration, a 200,000-plus hours MTBF, an operational voltage range from 12 to 32 V, and a low 20- to 40-mA average current requirement. The sensors function well with multiple sensors in the same location and they are RoHS- and CE-compliant. A six-pin screw terminal header is included to simplify system connections for quick installation in applications such as: tank level measurement, tide/water level monitoring, solar/battery powered applications, industrial automation and outdoor vehicle detection. The 4-20HR-MaxSonar-WR sensors (and previous IP67 MaxBotix sensors) are manufactured in a variety of packages for easy mounting in existing fittings. The sensors are available in M30x1.5, 1″ BSPP, 1″ NPTS, and 0.75″ NPTS PVC pipe fittings. Pricing starts at $199.95 each and $134.37 in 100-unit quantities. When it comes to a workspace, more doesn’t necessarily mean better. We encourage engineers and DIYers to focus their time and money on engineering, not on acquiring new and used equipment they’ll never use. Belgium-based Jan Cumps has a very basic yet effective workspace. It is a true workspace. That means he actually has room to work there. 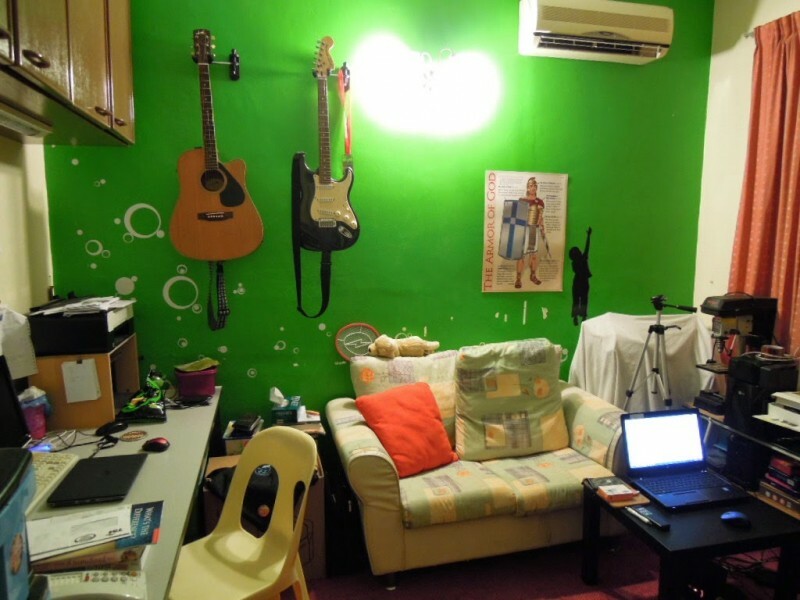 It isn’t a cluttered room for storing junk. I’m a clean-desker. Have to share it with studying kids. All gear has to have small footprint, or must be stow-away-able. That’s why you see a 4-in-1 multimeter, power supply, frequency counter and function generator, and a 2-in-1 hot air plus solder station. Components, meters, cables and what have you are stowed a way in boxes. 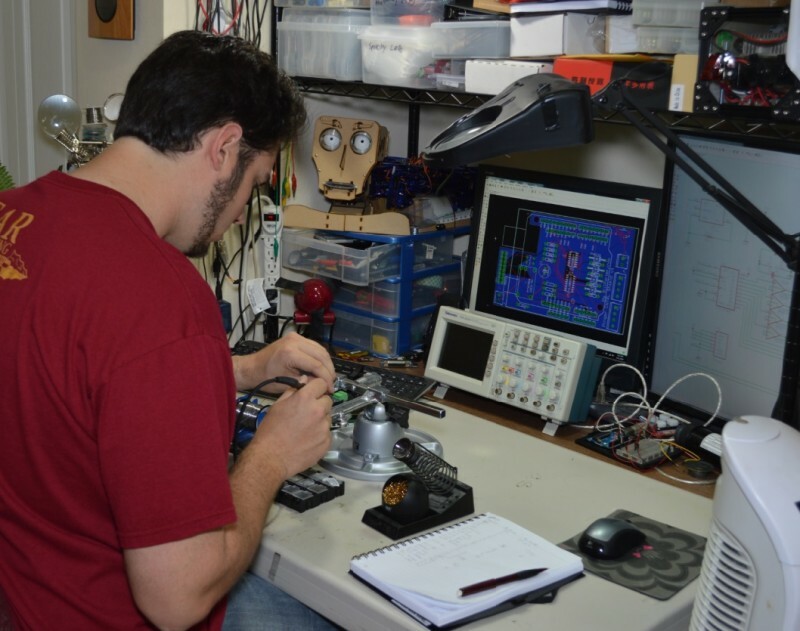 Chris Zeh is a San Jose, CA-based hardware design engineer who enjoys working with FPGA development boards, application-specific integrated circuits, and logic analyzers. He recently told us about the projects he is involved with at STMicroelectronics and explained what he’s working on in his free time. CIRCUIT CELLAR: Tell us about Idle-Logic.com. Why and when did you decide to start a blog? CHRIS: I started blogging in the winter of 2009, a little more than a year after I graduated Colorado State University with a BSEE. I realized that after graduating it was important to continue working on various projects to keep my mind and skills sharp. I figured the best way to chronicle and show off my projects was to start a blog—my little corner of the Internet. CIRCUIT CELLAR: What types of projects do you feature on your site? CHRIS: I like working on a wide range of different types of projects, varying from software development to digital and analog design. I’ve found that most of my projects highlighted on Idle-Logic.com have been ones focusing on FPGAs. I find these little reprogrammable, multipurpose ICs both immensely powerful and fascinating to work with. My initial plan for the blog was to start a development project to create an FPGA equivalent to the Arduino. I wanted to build a main board with all the basic hardware to run an Altera Cyclone II FPGA and then create add-on PCBs with various sensors and interfaces. My main FPGA board was to be named the Saturn board, and the subsequent add-on “wings” were to be named after the various moons of Saturn. The project proceeded nicely. I spent some time brushing up on my Photoshop skills to put together a logo and came up with a minimized BOM solution to provide power to the nine different voltage supplies, both linear regulators and switched-mode supplies. One aspect of FPGAs that can make them costly for hobbyist is that the programming JTAG cable was on the order of $300. Fortunately, there are a few more affordable off-brand versions, which I used at first. After many weeks of work, I finally had the total solution for the main FPGA board. 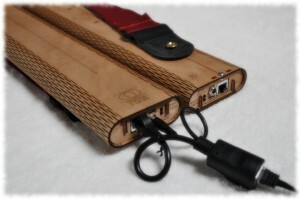 The total cost of the prototype system was about $150. Eventually I came up with a way to bit bang the FPGA’s programming bitstream using a simple $15 USB-to-UART IC breakout board driven by a tiny Python application, eliminating the need for the pricey cable. This Future Technology Devices International FT232RL USB-to-UART IC also provided a clock output enabling me to further reduce the component count. The project was a success in that I was compelled to completely digest the FPGA’s 470-page handbook, giving me a solid grasp of how to work with FPGAs such as the Cyclone II. The project was a failure in that the FPGA breakout board I wanted to use for the project was discontinued by the manufacturer. Creating and fabricating my own four-layer board and hand soldering the 208-pin package was both prohibitively expensive and also a little daunting. Fortunately, at that time Terasic Technologies introduced its DE0-Nano, a $79 commercial, $59 academic, feature-packed FPGA evaluation board. The board comes with two 40-pin general I/O plus power headers, which has become a perfect alternative base platform for FPGA development. I now intend to develop add-on “wings” to work with this evaluation board. CIRCUIT CELLAR: Tell us more about how you’ve been using Terasic Technologies’s DE0-Nano development and education board. CHRIS: The main project I’ve been working on lately with the DE0-Nano is creating and adding support for a full-color 4.3” (480 × 272 pixel) thin- film transistor (TFT) touchscreen LCD. Because of the large pin count available and reconfigurable logic, the DE0-Nano can easily support the display. I used a Waveshare Electronics $20 display, which includes a 40-pin header that is almost but not quite compatible with the DE0-Nano’s 40-pin header. Using a 40-pin IDC gray cable, I was able to do some creative rewiring (cutting and swapping eight or so pins) to enable the two to mate with minimal effort. Eventually, once all the features are tested, I’ll fabricate a PCB in place of the cable. There are many libraries available to drive the display, but for this project I want to develop the hardware accelerators and video pipeline from the ground up, purely though digital logic in the FPGA. I recently picked up an SD card breakout board and a small camera breakout board. Using these I would like to start playing around with image processing and object recognition algorithms. 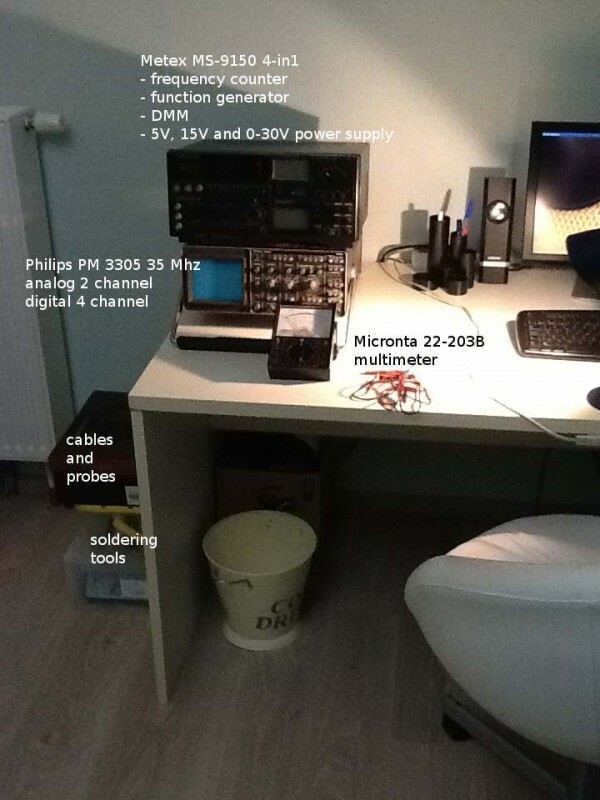 CIRCUIT CELLAR: What do you do at STMicroelectronics and what types of projects are you working on? CHRIS: My official title is Senior Hardware Design Engineer. This title mainly comes thanks to the first project I worked on for the company, which is ongoing—an FPGA-based serial port capture and decoding tool named the HyperSniffer. However, my main role is that of an application engineer. I spend most of my time testing and debugging our prototype mixed-signal ASICs prior to mass production. These ASICs are built for the hard disk drive industry. 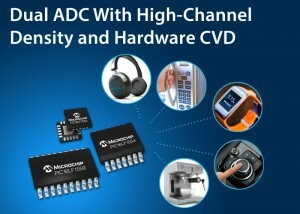 They provide several switch-mode power supplies, linear regulators, brushless DC motor controllers, voice coil motor actuation, and a shock sensor digital processing chain, along with the various DACs, ADCs, and monitoring circuits all integrated into a single IC. Our ASIC’s huge feature set requires me to stay sharp on a wide variety of topics, both analog and digital. A typical day has me down in the lab writing scripts in Python or Visual Studio, creating stimuli, and taking measurements using my 1-GHz, 10-GSPS LeCroy WavePro 7100A oscilloscope, several 6.5-digit multimeters, dynamic signal analyzers, and noise injection power supplies among other instruments. I work closely with our international design team and our customers to help discover and document bugs and streamline the system integration. A few years back I was able to join my colleagues in writing “Power Electronics Control to Reduce Hard Disk Drive Acoustics Pure Tones,” an Institute of Electrical and Electronics Engineers (IEEE) paper published for the Control and Modeling for Power Electronics (COMPEL) 2010 conference. I presented the paper, poster, and demonstration at the conference discussing a novel technique to reduce acoustic noise generated by a spindle motor. CIRCUIT CELLAR: Tell us more about the HyperSniffer project. CHRIS: The HyperSniffer project is an FPGA- based digital design project I first created right out of college. (My colleagues Vincent Himpe and Albino Miglialo did the board design and layout.) The tool is basically an application-specific logic analyzer. It enables us to help our customers troubleshoot problems that arise from serial port transmissions between their system-on-a-chip (SoC) and our ASIC. Through various triggering options it can collect and decode the two or three wire data transmissions, store them on on- board memory, and wait for retrieval and further processing by the application running on the PC. One of this tool’s nice features is that it is capable of synchronizing and communicating with an oscilloscope, enabling us to track down problems that happen in the analog domain that arise due to commands sent digitally. You can read the entire interview in Circuit Cellar 290 (September 2014). Linx Technologies recently announced the launch of its 11.5 mm × 14.0 mm HumDT wireless UART data transceiver with built-in networking with encryption. Each module can act as one of three components in a wireless network: an access point that controls a network, a range extender (to repeat messages and expand the network’s range, or an end device. Each access point can connect to up to 50 range extenders and end devices. The access point also supports routing so end devices can communicate with each. The transceiver automatically manages all routing and network maintenance functions. 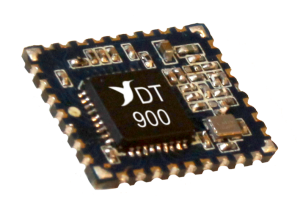 The 900-MHz HumDT version outputs up to 10 dBm, which results in a line-of-sight range of up to 1,600 m (1 mile), depending on the antenna implementation. The 2.4-GHz version outputs up to 1 dBm, resulting in a line-of-sight range of 100 m (300′). To aid rapid development, the HumDT Series transceiver is available as part of a newly conceived type of Master Development System. 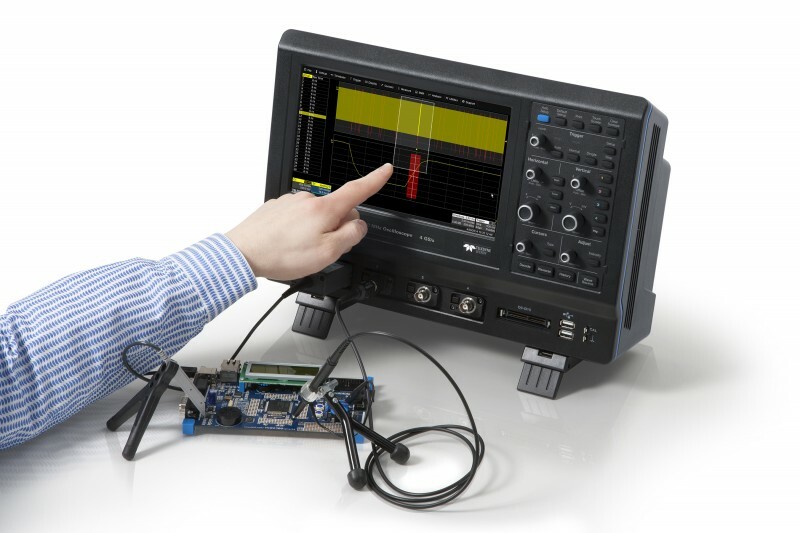 This development kit is designed to assist in the rapid evaluation and integration of the HumDT Series data transceiver modules. 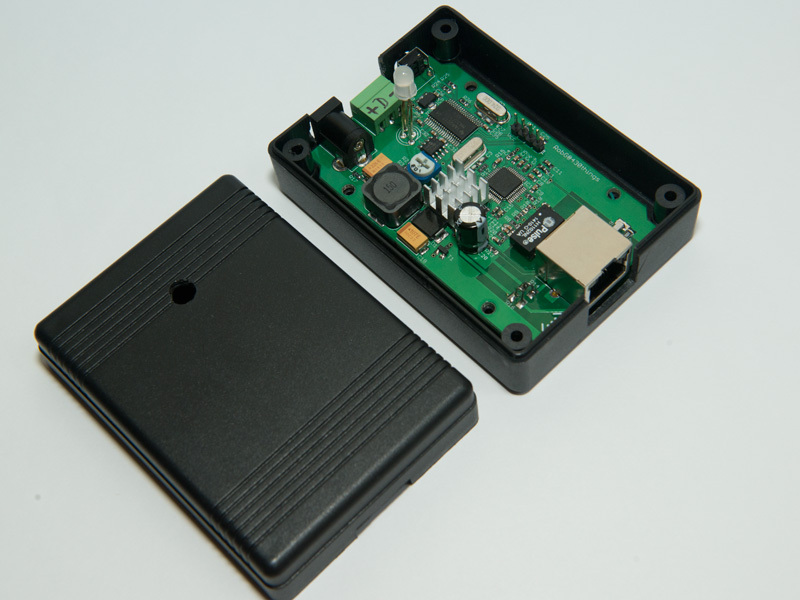 The all-inclusive system features several preassembled evaluation boards, which include everything needed to quickly test the operation of the transceiver modules. 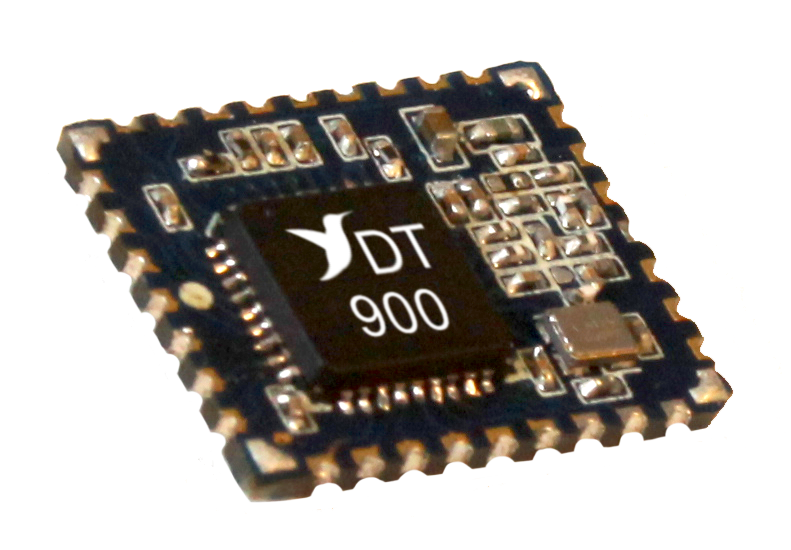 At below $9 in volume, the Hummingbird platform is a low-cost complete wideband transceiver with microcontroller module.